One is that the cities are today under the waters of the southern tip of the Dead Sea. Another is that they are located on the Jordanian shore of the Dead Sea on a plateau where five archaeological sites have been located. However, these five sites are five hundred feet above the plain on a plateau, not the plain as is so specifically stated in the Bible. Also, they are far too small to have been cities — the largest was ten acres and the next was two acres. Searching for the locations of these cities was never Ron’s intention. 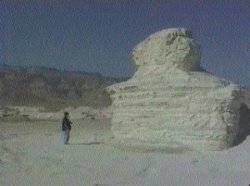 But from 1978 on, Ron made many, many trips along the Israeli coast of the Dead Sea as he traveled to the various sites he worked on, and in the early 1980’s he was suddenly struck by the strange appearance of some “formations” he passed. They looked to him like city walls and buildings, only whitish in color. For many years, he did nothing about his suspicions but in 1989, I received a call from him while he was in Israel in which he told me he thought he had located the five sites. He described their locations and asked me to do some research into what the Bible said regarding their locations. He told me the sites were not concentrated at the southern end of the Dead Sea but instead were spread out over many, many miles, from just below the southern tip of the Dead Sea to about ten or so miles above the northern tip. In the past, he had just driven past and noticed four areas, but this trip he had driven further north, seeing if there was a fifth. There was. Also, he and his crew had driven into one of the whitish areas and discovered something that convinced Ron that these whitish colored formations weren’t just geological. He found a spot where a road had been cut through some of the whitish material and where the fresh cut was, the freshly exposed interior of the material displayed a layering effect which swirled in such a manner as to make it obvious that these weren’t geological layers. In viewing a map, it seemed strange that Sodom, Gomorrah, Admah and Zeboim would each be listed if they were all in the same general location, at the south end of the Dead Sea. It seemed logical that the cities were to be located along at least “some” distance to all be included in this Biblical description of the borders of Canaan. And Saul, and Jonathan his son, and the people that were present with them, abode in Gibeah of Benjamin: but THE PHILISTINES ENCAMPED IN MICHMASH. And the spoilers came out of the camp of the Philistines in three companies: one company turned unto the way that leadeth to Ophrah, unto the land of Shual: And another company turned the way to Bethhoron: and ANOTHER COMPANY TURNED TO THE WAY OF THE BORDER THAT LOOKETH TO THE VALLEY OF ZEBOIM TOWARD THE WILDERNESS. 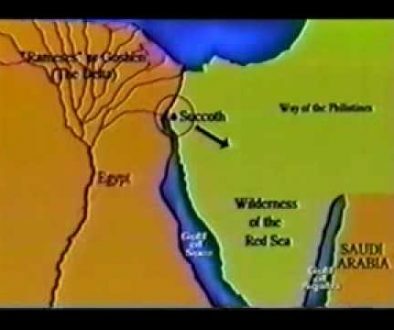 Examining a map, I saw that this description of the Philistines coming out of Michmash had one company going north, one going west, and the last one heading directly east- and the one heading east to the Valley called “Zeboim” was heading to the same place that Ron found the last site! It made perfect sense that the name of the city was preserved throughout the years even though the city was long ago destroyed, just as Mt. Sodom even today still bears the name “Sodom”. Israel had displaced the Canaanites- Zeboim was a border city of Canaan, and now its ashen remains were a border of Israel. Later in 1989, we visited the site just below Masada and took samples of the whitish material which we all discovered broke right off in our hands and disintegrated into particles the consistency of talcum powder. It certainly LOOKED like ash! But what to do about this information was a puzzle. After all, these sites have been right out in plain sight since their destruction in about 1897 BC. What did people think they were? I asked some people who were filming a TV commercial for a blue jeans company at one site what the strange formations were. Their reply was that they were formed when the Dead Sea had once covered the entire area. Interesting. When we had the whitish material tested at several labs, we were told it was ash. Not only that, but we were told by several geologists that any area that has ever been underwater will contain CLAY. The whitish material contained no clay. It had never been underwater. But even more importantly, if the whole plain area between the Dead Sea and the mountains had once been underwater, then these formations would have been evenly distributed over the entire area that had been covered. Yet, they weren’t. They were isolated. What to do next was a puzzle. Everyone agreed that it would be quite difficult to convince anyone that these were the sites without some conclusive evidence. And Abram…went…to Bethel,… between Bethel and Hai; Unto the place of the altar, which he had made there at the first: and there Abram called on the name of the LORD…. What this means is that the area Lot saw WAS the northern end of the area now occupied by the Dead Sea. When he traveled EAST, this is where he journeyed to. And then, it said he “dwelled in the cities of the plain”, which is not a specific designation, and then that he “pitched his tent toward Sodom”, or went in that direction. We later learn that he took up residence in that city. So, the Biblical account shows that the “Plain of Jordan” did indeed cover a large area since the northern region is what caught Lot’s eye. Then, it describes Lot “dwelling” in the “cities of the plain” and then pitching his tent “toward Sodom”. Perhaps this is describing Lot’s travels, with him first staying in other cites and finally continuing on in the direction of Sodom, where we know he finally settled. We must remember that Lot had a tremendous amount of animals because the whole reason he separated from Abraham was because their combined flocks were too much for the land around Bethel. So, as Lot journeyed through the plain, he had to travel slowly, taking his flocks with him. Wherever he stopped along the way, he had to have enough pasture land for the animals. And when he finally settled in Sodom, he still had to have pasture land for his flocks. This indicates that there was pasture land near the city. The sites Ron located are all several miles apart, with plenty of land between them. 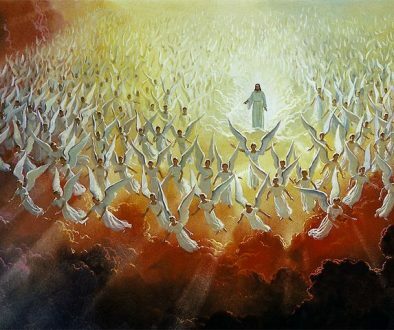 What “Remains” Should be Expected?The Biblical account tells of a conflagration in which balls of brimstone (sulfur) rained down from heaven (the atmosphere), completely burning the cities up. Josephus’ description perfectly describes what can be seen in these five ashen sites. All whitish in color, the shadows and shapes display all the visual characteristics of ancient cities and walls. The destruction of these cities took place approximately 3,900 years ago, so it is quite amazing to find ANY remains of ashen heaps. That they were destroyed in a Divine manner is understood, but it appears that they were also preserved in a Divine manner as well. These weren’t composed of the kind of ash we commonly think of, that blows away into the wind. It was compacted ash — the material was densely-packed and crusty on the outside. But when broken open, the substance was much softer, and with continual crushing, was soon reduced to powder. Since combustion is a chemical process, we read up on and discovered that the study by the Frenchman, Lavoissier, on the nature of oxygen and combustion came about when he discovered that substances burned with sulfur had a HEAVIER remaining ash than the original unburned substance. Further study into combustion got extremely complicated — much too much to get into here — but indicated that the event of the destruction of these cities was the result of a carefully controlled chemical reaction that took place VERY rapidly, yet maintained an equilibrium that didn’t result in an explosion. When Abraham arose, he saw the sky filled with black smoke. With flocks to tend, Abraham most certainly got up very soon after the sun arose, and found the event already finished. One of the interesting features of these sites is the layering present in ALL of the ashen material. Hundreds and thousands of layers are present, none very thick. In very high temperature fires, and/or in very hot flames containing alkali metals or alkaline-earth metals (for example, sodium and calcium) the positive and negative ions attract and repel, resulting in this layering effect. We know the flames had to be extremely hot in order to completely burn stone and metals; and we know there is a tremendous amount of sodium (salt) in the region — the Dead Sea has the highest concentration of salt in any body of water on earth. And, the largest salt dome, Mt. Sodom, is also in the area. Was ZOAR Destroyed?One potential puzzle arose when Ron found five sites instead of four. The Biblical account tells that Lot and his daughters were allowed to flee to Zoar in order to escape the impending destruction. Yet, this fifth city was located just a few miles beyond the southernmost site, which would have been Sodom. In between this small site and Sodom was a segment of Mt. Sodom, and this fit the picture from Genesis perfectly. And Lot went up out of Zoar, and dwelt in the mountain, and his two daughters with him; for HE FEARED TO DWELL IN ZOAR: and he dwelt in a cave, he and his two daughters. And the firstborn said unto the younger, Our father is old, and THERE IS NOT A MAN IN THE EARTH to come in unto us after the manner of all the earth: Come, let us make our father drink wine, and we will lie with him, that we may preserve seed of our father. For some reason, Lot became afraid to continue to stay in Zoar, so he and his daughters left. The next thing we read is that they dwelt in a cave and his two daughters state that there are no men left “in the earth” to “come in unto us after the manner of all the earth”, or in short, to make them pregnant. This tells us that for some reason, shortly after leaving Zoar, they believe they are the only people left on earth. Why would they think this unless they had just witnessed the destruction of Zoar? The area of land that had been affected by the conflagration which destroyed Sodom and Gomorrah was extremely large, and to Lot and his daughters, it probably looked as if the entire world had been destroyed, except for little Zoar. Then, as they dwelled in Zoar and witnessed the fact that its inhabitants were just as wicked as those of Sodom, they expected its soon destruction, which is exactly what occurred. Whether this happened the next day, or week or month, we have no way of knowing. But Josephus, in our earlier quote, also states that “five cities are still to be seen”. Recognizable Structures of a CityOur next plan was to actually go into the best preserved site, which was Gomorrah, and see if we could locate the perimeters of the city walls and trace any of the streets. A tremendous amount of erosion had taken place over the last almost 3,900 years, and we didn’t expect too much. But we were in for a tremendous surprise. As we parked and followed along what looked like the northern wall, we soon saw a very interesting object sitting by itself, a few hundred yards from what we believed was a wall. As we neared it, its shape became obvious. It was shaped like a sphinx. And from this sphinx, we saw that we had arrived at a place where the “wall” had an open place exactly like an entrance- probably the main entrance. Walking down the “streets” we discovered that they truly did communicate with each other like streets. If these had only been gullies from flash floods, they would have washed down from the mountainside in a random pattern. But there was an order to all we were seeing. Another interesting thing was that it appeared that the structures (buildings, etc) were set quite a bit higher than the level we were walking on, and that below a certain level everything looked likes heaps of white powder. Digging down, we discovered that we were walking on a level very close to the bedrock. This indicated that not only had the cities been burned, but even the ground dirt had been turned to ash right down to the bedrock. This caused the paths we were walking along to be eroded down to a much lower level than the sections that looked like structures. The next thing we did was ride the cable-car to the top of Masada in order to view the remains of the best preserved site from an aerial point of view. The road turning off of the main road along the shore of the Dead Sea which leads to Masada cuts through the remains of the site of Gomorrah. From atop the mountain, the remains revealed features that we couldn’t distinguish from ground level. From here, we could see sections which looked exactly like artificially-raised platform areas of other ancient cities which were temple areas. 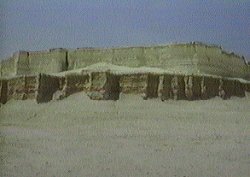 These “platform areas” showed vast flat areas with ziggurat-shaped masses on them, as well as large ashen “chunks” which bore the overall resemblance of the sphinx we had first seen, only these were much larger. On areas where the ground level would rise, the ashen structures seemed to be terraced, following the lay of the land. The walls extending around this site displayed one feature that was very exciting — it was “double-walled”, exactly like the Canaanite city walls of other excavated sites. Where the wall had an opening in it on the northern side (which we believe was where the gate was, and therefore an entrance into the city) there was a tall structure on the western edge of this opening, exactly like a gate “tower”. There was no doubt that all of these features were simply beyond the realm of simple coincidence. But at this point, Ron still felt that there had to be SOMETHING which would prove these sites to be the cities, and which would prove it beyond a doubt. But what this might be, we simply didn’t have a clue. Well, actually we did, but we didn’t understand it. A VERY Strange Evidence?In August of 1990, I had taken a small sample of ash, about four inches long, and was about to wrap it in tissue paper and place it in a plastic soap-carrying container. As I handled it, the layers loosened and separated, revealing a very, VERY strange site within the white material. I took it to Ron because it looked to me like an eyeball. I knew it wasn’t — actually, it was a perfectly round hole within the ash surrounded by a reddish ring of hard, crusty material. But Ron didn’t have any idea what it was. We filmed and photographed, roaming throughout the site on the “streets”. When we returned home, we met Richard Rives, who had read Ron’s book and was very interested in the research. Richard owns a travel agency and offered to help us get good airfares. Then, Ron asked him if he would be interested in also going over and helping with the field work. He was interested and two months later, in October of 1990, Ron and Richard returned to the site below Masada — the site we were sure was Gomorrah. The Evidence We had Prayed ForWe had asked several of our friends to be praying that we would find the evidence that was needed. Sometimes its hard for us to know if something we feel led to work on is something the Lord wants us to pursue, or whether its a project of our own choosing. We all felt like this was important, but we also still knew we needed that “definitive” evidence. In October, when Richard and Ron arrived, they discovered it had just rained. This is a very rare occurrence in this area which receives as little as 1/4 to 1/2 inch of rain a year. It was still overcast while they were there, which helped immensely. The bright sun on the white ash was almost blinding, but now they could see quite well. And as they wandered through the area, Richard saw what looked like an open room or cave up ahead and asked Ron if they could go investigate it. They would have never gone in that direction if Richard hadn’t seen this, but now they headed for it. And as they walked, they came upon a very large chunk of ash that had just recently fallen from quite a high section- probably because of the recent rain. Ron stopped to view this and saw numerous yellowish balls inside this broken ash, all surrounded by a reddish-black, crusty ring. Prying one out, he recognized it as sulfur. Smelling it, he KNEW it was sulfur. Here was the evidence they needed- all through the ashen remains were round balls of sulfur (brimstone) encapsulated in burnt crystalline. Now we knew what my “eyeball” was! In my specimen, however, the sulfur had apparently fallen out as it separated while I was carrying it for several hours. As they looked around, now knowing what to look for, they saw these sulfur balls literally everywhere they looked. Before, we hadn’t been able to see them because the loose ash had covered everything. But now the rain washed away the loose ash and caused this section to fall way, revealing these sulfur balls embedded through the ashen material. The reddish-black crystalline material surrounding the sulfur balls showed that they had once been on fire. It seems that as these burning balls of brimstone fell from the sky, they burned right through everything. And as they burned, after a while, molten material surrounding the sulfur cut if off from the flame, preserving it in the interior of the ashes. 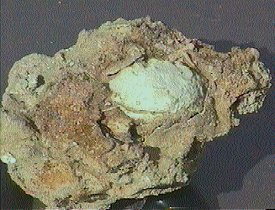 What was discovered was that as the ashen material erodes and these sulfur balls become exposed to the surface, they fall out of their capsule and can be found lying all over the ground. But we hadn’t been able to see them before because they had been covered with the loose layer of ash. We began to research sulfur to see if sulfur in this form had been found anywhere else. Richard, Ron, and I went to the Smithsonian and viewed their display of sulfur in its various forms, none being rounded balls. But to be sure, we asked to see their other specimens, and were shown their complete collection of sulfur which consisted of over fifty specimens. Again, none were in this form. In Newsletter #8 (July 1994) we briefly discussed the crystalline capsules which surround the sulfur. The reddish color surrounding the sulfur balls was a result of the heat: The Colour also changes, deepening from yellow to dark red, and, finally, to black at about 250 degrees C (482 degrees F). The variations in both colour and viscosity are considered to result in changes in the molecular structure.” “Encyclopaedia Britannica (1985) Vol. 13, p. 816. PLEASE NOTE- in our July newsletter, it stated that 250 degrees C (Celsius) was 280 degrees F (Fahrenheit), which was what the encyclopedia showed. However, it was in error. The accurate conversion from Celsius to Fahrenheit is 482 degrees — multiply C by 9/5 and add 32 degrees to attain the Fahrenheit equivalent. “…a region on which brimstone was rained will show brimstone. Well, it does; we picked up pure sulfur, in pieces as big as the end of my thumb. It is mixed with the marl of the mountains on the west side of the sea, and now is to be found scattered along the shore of the sea even on the east side, some four or five miles distant from the ledge that contains the stratum. 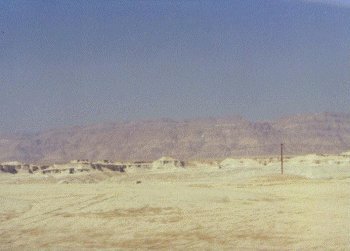 It has somehow scattered far and wide over this plain.” “Explorations at Sodom” by Dr. Melvin Kyle, 1928, pp. 52-53. Our next task was to check each of the five sites and be sure there were sulfur balls at each one. Ron and his team completed this except for one site — the site of “Zeboim”, north of Jericho. In January of 1991, we found the site was now off-limits, behind the fencing that comprises the “neutral zone” along the Jordan River. With three strands of barbed wire running along the top, we decided we had better just wait for a better time. The site, “Zoar”, is located just below a checkpoint, and we didn’t want to bring a lot of attention to our being there, so we quietly explored this one, finding the sulfur balls plainly exposed in the ashen structures. Sodom was by far the largest site, and a bit more difficult to get to. It is located behind Mt. Sodom in the plain that extends right up to the mountains, and it requires more walking and difficult climbing to get to. But, the sulfur balls were there also. As we mentioned, the sites have suffered a tremendous amount of erosion and the best preserved, by far, is “Gomorrah”. The site, “Admah”, at the northern end of the Dead Sea, is exposed to a great deal of wind as it is located in an area not as well protected by the mountains. Also, its ash has turned sort of brownish on the outside, probably due to something in the wind settling on it. Whenever a section breaks away, the pure white color can still be seen inside. These cities, with the exception of “Zoar”, were not small — they were very, very large with populations in the thousands. We know that the entire plain was a lush, beautiful area, compared with the Garden of Eden in the Bible. We also know that the Jordan River most likely, at that time, flowed all the way down to the Gulf of Aqaba. All rivers, with the exception of one that we know of in Africa, flow to either a sea, ocean or at least a lake. At the time Sodom and Gomorrah existed, we are told that where the Dead Sea now is, was a “vale” or valley that was full of “slime pits”, meaning it oozed bitumen. Since the cities were said to be in the plain, not in the valley, this proves that they were not covered by the waters of the sea. It also explains something else. Here we learn that the root of their sinfulness stemmed from their great wealth which led them to idleness and a disregard for those less fortunate than they. They were full of pride and haughtiness, thinking they were better than others. “In its various forms bitumen is one of the most widely distributed of substances”. In the Ebla tablets, one tablet listing some purchases and the price for each item in silver, shows that the highest price was paid for bitumen. And the people of these cities had only to walk out in their “front yard” and gather it. They had no reason to engage in hard work. They had a “gold mine” just there for the taking. This also explains why the kings of the great nations wanted to make them vassals — to participate in their great wealth through the extraction of tribute in the form of bitumen. This bitumen could also possibly have provided a hint as to a catalyst in the conflagration which occurred in this plain. Bitumen, or slime pits, result from an underground petroleum reserve oozing through to the surface. And all oil reserves have natural gas associated with them, which also can seep into the air. All of this is speculation, but the region yields the elements and evidences of an extremely cataclysmic occurrence — one in which a lake was formed, blocking the river from its continued flow and which devastated the entire plain to the extent that nothing grows there. Evidence from the Ebla TabletsWhen the archives at ancient Ebla (in present day northern Syria) were first discovered in 1975, the translator, Giovanni Pettinato, reported he had found the names of the five cities of the plain not only listed, but in the same order as in Genesis. 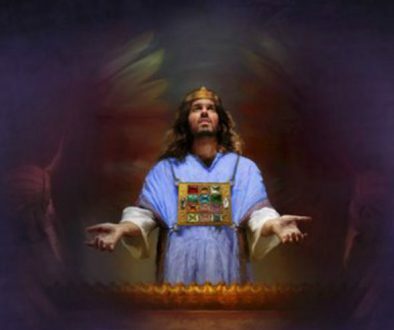 However, the Syrian government was “angered at the emphasis placed in the West on the tablets’ alleged Biblical significance”. (BAR, May/June 1980, p. 48) A rather large controversy then began over these tablets, which the Syrians felt were being used to link the Biblical Patriarchs with Syrian history, something they would not stand for. This finally resulted in Pettinato’s resignation and letter of recantation as to many of the translations. However, that’s just par for the course. These tablets reveal evidence that positively confirms the Biblical account and Satan is fighting hard to suppress it. The later appointed director of the Italian mission excavating at Ebla issued a statement which shows why Pettinato was forced to recant: “These allegations [linking the Ebla tablets with the Bible] were propagated by Zionist-American centres to be exploited for atrocious purposes aimed at proving the expansionist and colonialistic views of the Zionist leaders.” (Ibid., p. 49). That these made war with Bera king of Sodom, and with Birsha king of Gomorrah, Shinab king of Admah, and Shemeber king of Zeboim, and the king of Bela, which is Zoar. What is so exciting about these tablets is that they come from a well established city, one hundred forty acres in size, that existed during the time of Sodom and Gomorrah. The Biblical record reveals that Sodom and Gomorrah were destroyed just twenty-four years after Abraham left Haran, which is within one hundred fifty miles of ancient Ebla.